The Red Breather and Blue Adept decks were released in July 2012. The Silver Channeler and Brown Mauler decks are scheduled for release in September 2012. First ("Classic") Edition - All decks are printed on 269gsm card stock, featuring a black bordered design. Card backs are solid black with a green "D" logo displayed above the "Dragon Clash" name. The decks are packaged in a tuck box with common branding on the box face. 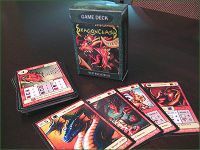 The dragon type is listed in text on the box face and a picture and description of the dragon is listed on one of the box sides.